Ossuccio Grande. Stylish home Ideally located in sought after sunny Ossuccio. Air conditioned home sleeping up to 8 guests with 4 bedrooms & 3 bathrooms. Ossuccio Grande is a beautiful brand new family home is located in a small recently constructed residence of only 5 homes and with direct access to the inviting swimming pool. The apartment is set over two floors with ample space for large families or friends of up to eight guests. The first floor and attic provide an ample living area of 180 sq. m. At the first floor level there is an entrance hall, a large living room with kitchen, breakfast bar, dining for eight and acss to the large terrace which opens with stunning lake views overlooking Isola Comacina. 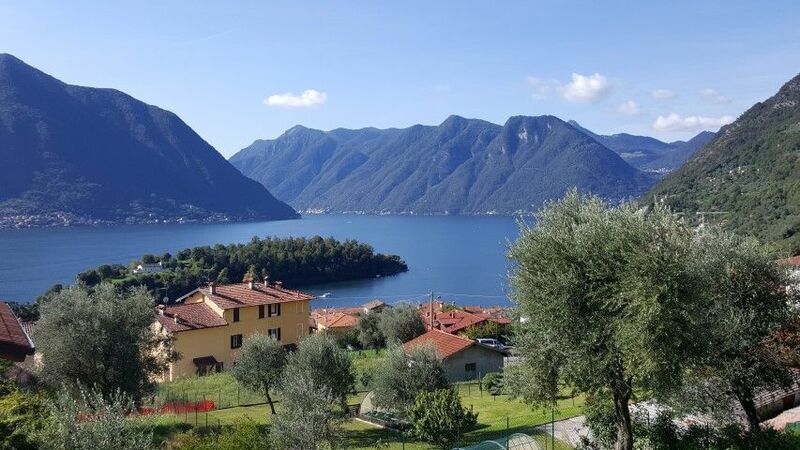 The home is located in sought after Ossuccio offering superb views and a sun kissed location, ideally located to visit the many beauty spots and landmarks on the west side of the lake. The home consists of four bedrooms, two doubles and a twin bedroom plus an additional bedroom or office as the 4th bedroom can also be used as a day room as it features a desk and 'day bed' which pulls out to form a bed with 2 single mattresses (so sleeps 2). The room has a small balcony. The home features three private bathrooms. Two showers and a bath for your convenience. The apartment has small garden to the rear and a private garage for parking for two vehicles. This two story apartment is brand new and equipped with a modern kitchen with top quality appliances including cooker, dishwasher, microwave, fridge freezer with water dispenser, kettle and toaster. The home also benefits from a small laundry with a washing machine. The luxurious interior and Italian design furniture offer great comfort. The home has been tastefully finished with parquet wooden flooring throughout except for the bathrooms which have high quality tiles. The apartment also benefits from underfloor heating and air conditioning in all bedrooms as well as the living room. The property has been furnished a modern contemporary style with high quality fittings especially in the kitchen area where the appliances are a top quality Italian brand. There are two widescreen TV's - one with a playstation 4 - and WiFi is available at a nominal cost of Euro 30 per week. The home forms part of a private and exclusive, small complex with four private homes which share a large swimming pool and terrace with views of Lake Como. Ossuccio centre and the lake front are 10 minutes walk down with restaurants, pizza and wine bar plus a lovely park where you can dive into the lake located within walking distance. The supermarket is a 5 minute drive as is the ferry, 007 Villa Balbianello. A mini market and boat hire are available 15 minutes walk down from the home. Please contact us for more details or to reserve your stay here at Ossuccio Grande. Spell binding lake and mountain views. A perfect relaxing apartment for large groups of friends and families. Three bathrooms featuring two with showers and one with a bath. All with wc's. One of the bathrooms is located on the ground floor with a shower and one of the other bedrooms. The other two bathrooms are located on the first floor with the three remaining bedrooms. Parking for 2 cars plus a communal area . Towels, linen and bedding supplied. The kitchen area where the appliances are a top quality Italian brand, fully furnished plus breakfast bar. Plenty of outside space for alfresco dining. Please note guests are required to remove waste to be removed on departure. Property was very nice and Lenno is a very nice town. I had asked how far the property was from the shops, bars and restaurants and I was advised that it was an eight minute walk. Unfortunately it was 20 mins but approximately 700 hundreds was down a very steep hill and unfortunately my wife could not climb same on return which meant we had to rely on my son to come and pick us up in the car. If I had known I would not have booked the property. The Wi Fi was slow and I expected a lot better. The bedrooms are described as being Attic rooms and they were so much so that I had to crawl into bed as the far side was no more than 4 feet high. To correct some of the points you have raised. We communicated the walk to the lake was approximately 10 minutes at the time of the lake. We also advised the walk was downhill and therefore the walk back up the hill would be longer. As you can see from the photos the home is located in an elevated position to make the most of the panoramic lake view. Guest can also check the address of the home in order to see the location ahead of reserving the home or viewing the map location. Further more we write on the advertisement "The supermarket is a 5 minute drive as is the ferry, 007 Villa Balbianello. A mini market and boat hire are available 15 minutes walk down from the home." To date we have not received any negative comments regarding the wifi. The only issue was on your departure after one of your guests had tried to reset the modem and we had to call an engineer to reconfigure the password which I am happy to report is now fixed. Regarding the bedding, the cleaning team professionally clean the home ahead of each arrival and provide towels and linen for your every stay. We providing additional towels on arrival as your stay was for two weeks. The home is a self catering apartment and a washing machine is available at the home. As your stay was for two weeks we provide on request additional cleaning and linen which is a paid for service which originally offered to you to which you declined and then requested later on during your stay which we provided at a reduced cost for you and the cleaners we happy to organise following your last minute request. As you can clearly see from the photos of the bedrooms are clearly shown so you can see the rooms have an apex roof in three of the rooms so less height on the side. We are completely transparent to guests booking as we wish for the home to be booked for the right guests only. The home was modern,spacious and clean! Our Lake Como experience was fantastic! Bonus was this lovely home!!! The home is tucked away in a quiet neighborhood which we absolutely loved since we are two families with young children. However, it isn't far from Lenno public ferry station which was nice! Upon entering the home, first thing I noticed was the huge kitchen! The oven was new although it did not work during our stay,it wasn't a big problem. All appliances was updated and was large capacity which is a really nice feature for families like ours since we like to prepare our breakfast and dinners! The kitchen has everything you need. The views of the lake was beautiful and serene! The bedrooms were large and had ample built in closets for longer stays! The pool is perfect for helping us keep the kids entertained after spending the day exploring. I can't say it enough but everything about this property is perfect! When we come back, we'll definitely book this property again! Thanks Gemma for making our stay at Lake Como more enjoyable and worry-free due to your property! We stayed with our family in this large 3 bedroom apartment for 2 weeks. It is a very spacious apartment that easily sleeps 8 (our family of 6 and grandparents). There is a 4th bedroom/playroom that has a comfortable pull-out twin bed. There is also a desk with 2 chairs for teenagers/kids to use their laptops, computers, iPad. The apartment has 3 bathrooms (all with showers and 1 with a bath tub) which was really convenient for our family. The apartment is very nicely furnished and seems to be brand new. The kitchen has all the branded appliances including microwave, toaster, dishwasher. On top of that, there is a Nespresso machine for the early morning coffee on the balcony. There is also a washing machine in the apartment itself. The living room has a comfortable sofa and stylish dining table. Their is a large curved screen TV and even a TV with PlayStation 4 in one of the bedrooms upstairs. And then there are the views. The apartment is in a somewhat elevated position overlooking the lake and the surrounding mountains. Both from the balcony (with a dining table and lounge chairs) and the pool area, you can enjoy the views at any time of the day. Very relaxing to just sit on the balcony and watch the planes land on the water, the boats passing by and the the view on Isola Comacina. If you are fortunate enough to be here in June you can see the amazing fire works from the balcony on 27th and 28th June 2016. We were so fortunate to have experienced this event at this apartment last year. The apartment is about 500 meters from the lake shore and also close to the UNESCO heritage site of the Sacri Monti church. A supermarket is nearby in Lenno (5 minutes drive), it took us around 8 mins to walk. On the lake shore in Ossuccio, there is a boat rental service and a taxi service to Isola Comacina. There is recreation park where you can swim in the lake as well. It was really nice to be welcomed by the local host who not only showed us the apartment, but also provided a lot of information about the area. Moreover, there was a beautiful bottle of wine upon our arrival in the apartment and the owner provided some essentials like dishwashing tablets and a few Nespresso capsules! Overall, we had an excellent stay in this beautiful apartment with fantastic views. We will come back next year and would definitely recommend it to our friends. On our arrival in Ossuccio (from Australia) we were met by the property manager, a very helpful local. He kindly showed us around Ossuccio before taking us to the apartment. It was a lovely welcome and meant we could easily navigate our way around and knew where to go to buy food etc. The apartment is beautifully appointed, spotlessly clean and very spacious. From the three bathrooms to the very well equipped kitchen with everything you could possibly need. Beautiful appliances including large oven and cooktop, microwave and dishwasher. The bedrooms are also very large with loads of cupboard and hanging space and amazing views over the lake. We stayed for two weeks so the washing machine was also a wonderful addition. The living and dining rooms are beautifully furnished and extremely comfortable. Then there is the balcony! The view looking over Lake Como is absolutely breathtaking. It was hard some days to drag ourselves out of the comfy chairs on the balcony to go sightseeing, and there is plenty of that to do. The balcony also overlooks the lovely swimming pool. We loved our stay and had absolutely no complaints. When travelling as a family this large immaculately clean property suited us perfectly. I would have no hesitation recommending this property to friends and family. We loved our stay at this apartment in Ossuccio. It is located on an elevated position in the town of Ossuccio close enough to the lake and various attractions and far enough for it to be quiet and private. The apartment is in a small complex of 4 apartments with a shared pool. Because the other apartments were not yet occupied, we had private use of the beautiful pool with views of the lake. The apartment is modern with a nice living room and open kitchen with all appliances. It has a great balcony with the most beautiful views of Isola Comacina and Lake Como. It has 4 bedrooms (3 upstairs and 1 downstairs) with nice bedding and views from the windows. The downstair bedroom has an office table and a twin bed. There is also a lot of cupboard space. One bedroom upstair has a TV and a playstation. The apartment has 3 bathrooms and a laundry with washing machine. In terms of indoor entertainment (although there is so much to do outside! ), there is a large flatscreen tv with DVD and the apartment has its own WiFi. There are books, games and DVDs provided as well. We were met by the local host prior to check in and she provided a lot of information about the area and tips for restaurants, etc. They are really friendly and helpful - she even gave us her mobile number in case of emergency. We have a beautiful holiday in this apartment. Basically everything you need is there and it really feels like home. All the Lake Como attractions (Mennagio, Bellagio, James Bond Villla, churches, the ferries, and so on) are within easy reach. Local shopping is only 5 minutes drive to Lenno and restaurant are everywhere. I would recommend this apartment to anyone wanting to stay in the area. Tour guide available to give you tips on arrival or arrange wine tasting, cookery or painting courses. Details on request. 10 minutes walk down to the local park for sunbathing and swimming in the lake. 5 minutes drive to golden sand beach. Easy to locate from all airports from Milan Malpensa, Linate or Bergamo. Full directions given on request or with booking. Bellagio by car or Ferry. Como City. Villa Carlotta. Villa Balbianello. Armani shopping outlet. Milan. Switzerland. Monza grand prix 1 hr drive. Garden ideal for children to play. Wine tasting, boat hire. Villa Balbianello (and lido beach), Villa Carlotta majestic gardens, 5 and 10 minutes drive beach. Ossuccio park for sunbathing and swimming 10 minutes walk. Lake Como is the perfect holiday retreat for your stay in Italy. 22 miles of pool blue water, majestic mountains with a touch of dolce vita make this an idyllic holiday venue. Local regional home cooking, award winning gelaterias, fashionable boutiques, breathtaking gardens or just lounging on the beach are all activities that can be indulged in here. Lake Como is situated within Lombardy home also to Milan the fashion capitol of the world, Bergamo with its majestic squares & medieval churches & Monza for Grand Prix lovers! However if you are searching for something more serene Lake Como is a haven for tranquillity. For years young & old have visited Lake Como and returned home refreshed, invigorated and bewitched by its unparalleled beauty. Local shops plus a supermarket nearby. Please note 25% deposit is due to reserve the home. Balance due 12 weeks prior to stay after which no refunds apply €350 refundable security deposit is due in cash on the day of arrival and returned on the morning of departure. Home is fully cleaned and prepared for every arrival. with Newly laundered linen, bedding, and final cleaning Home is thoroughly cleaned and immaculately presented for each guest.